Employees help customers at the Wisconsin Division of Motor Vehicles Madison East office on Bartillon Drive on Thursday. DMV offices are issuing required photo identification cards for free to voters who need them. 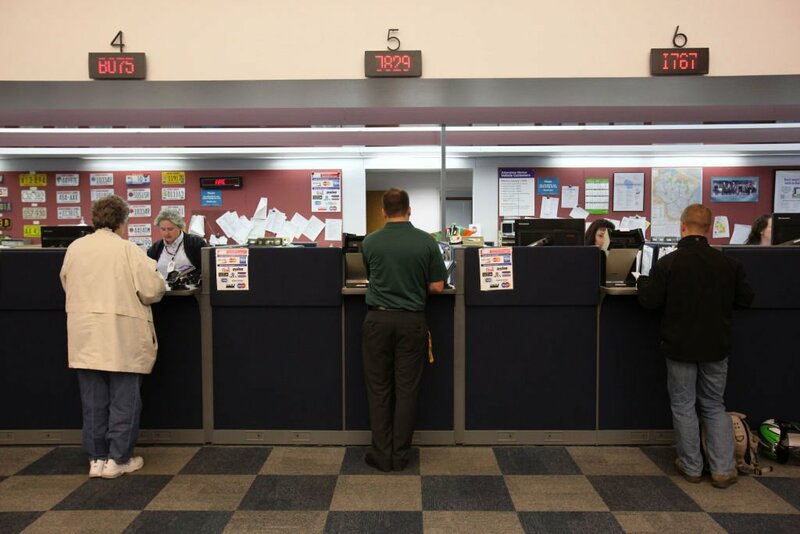 Several Wisconsin Division of Motor Vehicles service centers will extend their hours Saturday in response to a statewide network system outage that prevented the centers from issuing driver licenses and IDs for nearly three hours Friday, the Department of Transportation said. But she said her office has worked “extensively” with the DMV, which issues IDs, the state health department, which handles Wisconsin birth certificates, and the GAB, which runs elections, to ensure that voters without proper identification can get it. And since 2011, when the voter ID law was passed, DMV centers have been open extended hours and offered ID cards for free, Patrick said. The state also has developed a verification system for the “very small number” of people who do not have supporting documentation, such as a birth certificate, to prove their identity, she said. But Jay Heck, executive director of Common Cause in Wisconsin, said the lack of money devoted by the state appears to be a deliberate attempt to make it difficult for voters to comply with the requirement. On Friday, two groups that had tried unsuccessfully to overturn the voter ID law went back to the Wisconsin Supreme Court to ask that the requirement be delayed until after the Nov. 4 election to give voters more time to get the proper identification. Voter ID was passed by the Republican-run Legislature and signed by Gov. Scott Walker in 2011 but stalled by court challenges after a single primary election in February 2012. It was reinstated by a three-judge federal appeals panel on Sept. 12. That decision has been appealed to the full 11-member 7th U.S. Circuit Court of Appeals, which has not yet decided whether to rehear the case. About half of the states require identification to vote, and 61 percent of Wisconsin’s registered voters support it, according to last week’s Marquette Law School Poll. Backers say the requirement is a “common sense” measure that guards against voter fraud. Opponents argue that voter impersonation has never been seen in Wisconsin and that the requirement is designed to suppress voting by minorities, immigrants, the poor and elderly who are more likely to vote Democratic and less likely to have photo IDs. When voting-rights advocates sued the state, an estimated 300,000 Wisconsin residents lacked the government-issued photo identification required to vote. But there has been no crush of people seeking IDs in the first week since the appeals court ruling, said Jim Miller, the DMV’s director of field services. The 92 DMV centers cumulatively issued an average of about 220 original IDs a day — as opposed to replacements or renewals — this past week, which is pretty typical, he said. “We haven’t seen a spike,” Miller said. One explanation is that many people who need a photo ID to vote already have one, Miller said. The DMV has continued to offer free IDs for voting since July 2011, even after the law was put on hold. The DMV has issued 292,000 free IDs for voting since then, he said. That number includes originals, replacements and renewals, so it’s a little hard to draw clear conclusions from it, Miller said, but the hope is that some of the demand for IDs already has been addressed. Overall, about 83 percent of state-issued IDs are now given away free because people say they’re needed for voting purposes, he said. An additional batch of applications is pending for people who do not have a government-issued birth certificate. A new process allows the state to verify a person’s birth information without the applicant having to pay for or supply a birth certificate. But that number is small so far, too, Miller said. There were just 52 petition applications in the first three days last week, he said. Those people will have their photo ID cards mailed to them after their birth information is verified. Most should get the cards within six to eight days, Miller said. It is imperative that these voters get to a DMV center sooner rather than later, he said. While two of the three state agencies say they don’t expect to rack up extra costs, municipal clerks say they will spend thousands more to hire additional poll workers, reprint election materials and for postage to notify absentee voters of the requirement, which was reinstated nine days ago after some 12,000 absentee ballots had already been sent out. In Madison, City Clerk Maribeth Witzel-Behl said she plans to hire poll workers to cover 612 seven-hour shifts to handle additional duties including checking voters’ identification and issuing provisional ballots for those who lack proper ID. In addition, thousands of absentee-ballot envelopes and voting instructions are being reprinted to include language about the voter ID requirement, she said. Witzel-Behl has doubled the number of training sessions for poll workers from 60 to 120. And her staff is contacting voters who have already cast their ballots to instruct them to send in the proper ID so their votes will be counted. Some are out of town on extended trips or at second homes, she said, making them difficult to reach. “There are over 1,000 voters being contacted by us, and that’s being done one by one,” she said. The city of Milwaukee is facing similar costs, said Neil Albrecht, executive director of the Milwaukee Elections Commission. Albrecht said 1,500 city poll workers trained over the summer will have to be retrained before Nov. 4, along with 300 to 400 extra workers “to make sure it (voter ID) does not bottleneck voting sites on Election Day.” About 50,000 absentee ballot envelopes also will have to be reprinted, he said. One longtime Madison voter and poll worker, Gene Bliss Gay, said she was confused about whether she needed an ID to vote. She is 85 years old, doesn’t drive and has limited mobility. That means she qualifies as an “indefinitely confined” person who can vote absentee without sending in a copy of an ID. A city council resolution would create a workgroup to propose a municipal identification card program to make it easier for residents to get an ID to open a bank account or show police.